The Department of Education’s Strategic Framework 2018 -2022 sets the future direction of the department across the next five years. The centrepiece of the framework is the Education NT Strategy 2018-22, which commits to a strong public education system that gives every child the opportunity to engage, grow and achieve. 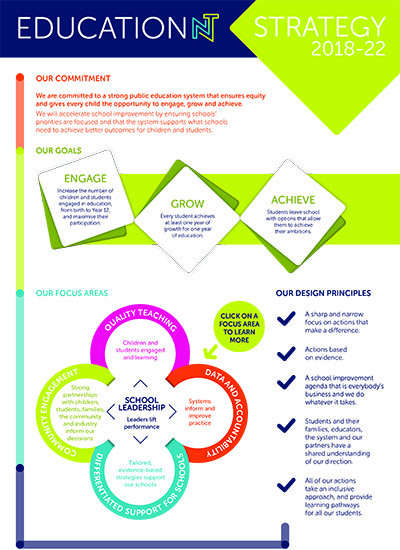 Development of the strategy included extensive engagement with 41 face-to-face consultations attended by 1054 students, teachers, principals, community members, regional and corporate staff and key stakeholder groups. In addition to ensuring that the efforts of the department in providing support to schools is focussed, annual school priorities will be identified each year, linked to the strategy’s goals of student Engagement, Growth and Achievement. Schools will select a minimum of two of the priorities in their Annual School Improvement Plans, and have the option of adding up to two additional priorities of their choice. Achieve: Increase the number of Year 12 completions. Success Together 2013 to 2015 - Key actions 2013 and 2014 (1.6 mb).